As office workers, sitting in the office for around 8 hours a day is pretty much the norm, no matter how harmful this habit can be. Sitting too long in one spot will not only make you feel bored but it will also increase your risk of catching some deadly diseases such as coronary heart disease, colon cancer, diabetes, and many more. This sedentary lifestyle is also very costly, as it costs the average UK employers millions just to cover the damages from the habit. 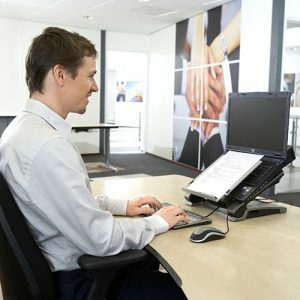 To help minimise the consequences from the sitting disease in the office, ergonomic accessories are the best and most readily available solution. Even though it is only a small change to switch to ergonomic mice or ergonomic keyboards, this step will benefit you greatly in the long run. Here is how. Our posture is one of the first things that others will take notice of as soon as they meet you, so a bad posture will definitely strike a bad chord. Unfortunately, a sedentary lifestyle is likely to harm your posture, hurting the first impressions that others might have on you. Ergonomic accessories, or more specifically, in this case, laptop stands, will help you to sit straighter and maintain direct eye contact with the screen. Over time, this will help to straighten your back and improve your posture, boosting your confidence considerably. From the trivial back pain and neck pain to the more serious RSI (repetitive strain injury) or Carpal Tunnel Syndrome, a lot of ailments can be traced back to inappropriate sitting posture or sitting for a long period of time. Over time, these ailments can cause some serious damage to your body. By using accessories such as ergonomic mice, compact keyboards or writing slopes, you will be much less likely to develop these minor inconveniences, keeping you one step away from future medical conditions. You might think that they are insignificant, but ergonomics accessories may actually boost your productivity greatly. Usually, even the most well-organised offices can cause clutters, as some stationaries are simply not designed to be ergonomic. Writing down a note will cause you to constantly look down and up, hurting your neck and costing you unnecessary energy. By simply switching to writing slopes and document holders, whose angles can be adjusted to perfectly fit your preferences, you will not have to spend much time bending your neck, saving you a lot of time and energy and boosting your productivity by a considerable amount. Every large change starts with a small one, and you too can influence your future life satisfaction by adopting ergonomic accessories. Although they might seem trivial, ergonomic accessories will, and should, be important assets in your office. If you are unsure about where to find high-quality ergonomic accessories in the UK, why not let us at Back2 assist you? With our diverse range of high-quality and affordable accessories, we are confident in our ability to provide you with simple yet effective solutions to sitting diseases. For more information, please contact us on 0207 935 0351. Posted in on 25th March 2019 by Back2.